Generally speaking, Uruguayans enjoy a higher standard of living than people in most other Latin American countries. According to the tenth edition of Global Studies: Latin America , in the early 2000s, Uruguay had the third highest per capita income (US$8,500) in South America after Argentina and Chile. Both the adult literacy rate (97.3 percent) and life expectancy (72 years, male, and 79 years, female) demonstrate a political commitment to education and health care. Extreme poverty is unusual in Uruguay, and most of the population enjoy an adequate diet and at least a minimal standard of living. Health care is within the reach of all citizens, and women are granted equality before the law. This publication claims that high levels of literacy and a large middle class allows Uruguay an intellectual climate that is superior to many much larger nations. Over 90 percent of the population of 3,335,000 live in urban areas (especially the capital city Montevideo, population 1.3 million). The major languages are Spanish, Portunol, and Brazilero. The ethnic makeup is 88 percent white, 8 percent mestizo (European and indigenous ancestry), and 4 percent black. Uruguay emerged from the government censorship of the 1970s into what was generally considered a free press from the mid-1980s into the early 2000s. The World Press Freedom Review considers Uruguay to have a "vibrant media," citing the more than 100 daily and weekly newspapers, approximately 150 radio stations, 604 radio receivers per 1,000 population, 34 regular and cable television channels. and three commercial television stations. Some 825,000 main telephone lines exist within the country. 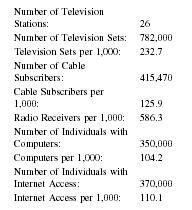 There are 232 televisions per 1,000 persons, and at least seven primary Internet providers as of the year 2000. The daily newspaper circulation is 241 per 1,000 persons. The newspaper with the largest circulation, El País (founded in 1918), has a circulation of approximately 130,000. Along with other papers and magazines, it has well-developed Internet sites. Most newsprint and broadcasts are in Spanish, but at least two newspapers, Uruguay Post and Penguin News , are in English. This fact is explained by Uruguay's proximity to the Falkland Islands and thus the British influence it feels. From the 1970s and continuing into the 2000s, the newspaper industry experienced an economic downturn, and dozens of newspapers and magazines were forced to close as a result. In part, the economic problems were brought about by the reduction in state companies' spending on advertising. Newspapers and magazines from the interior of Uruguay were affected the most because they had fewer readers and hence less opportunity for profit than publications in Montevideo. Nine newspaper agencies closed in 2001: El Diario , La Mañana Guambia , the weekly El Día , the evening Primera Plana , Prensa de los Viernes , the weekly Causa Abierta and the weekly magazines Tres and Posdata . The most widely distributed papers in Uruguay are El País followed by El Observador and La República . Because of its sweeping social and economic changes in the early twentieth century, Uruguay was known as the "Switzerland of Latin America." The effects could be seen in an evenness of income distribution that is uncommon in developing countries. The 1960s and 1970s were times of social and military upheaval as in many Latin American countries. By 1980, however, there was a return to civilian rule after a national referendum. Uruguay has a unique law regarding change of power: the Constitution states that if 25 percent of the voting population signs a petition, a referendum will appear on the next voting ballot. As of 2002, Uruguay was a multi-party democratic republic and operated within a free-market economic framework. The economy of this small country is integrated with that of larger Argentina, Chile, and Brazil. In March of 2000, Jorge Batlle assumed the presidency of Uruguay, as the country was confronting a serious economic and political crisis after the devaluation of the Brazilian real in January 1999. There had been a move to privatize some sectors of the economy in the late 1990s. The country has a mixture of private and state enterprises and is heavily dependent on agricultural exports and agro industry. Opinion polls, however, show that most Uruguayans support state ownership of critical industries, especially in the face of a sustained recession, a public debt of 45 percent of the gross domestic product, and neighboring Argentina's existing economic crisis. Batlle planned to leave state-owned firms untouched but allow private companies to compete with them or tender bids to operate their services under contract. In the early 2000s the press was legally free and unrestricted, as was speech. The political process is open, and academic freedom is the norm in the national university. Publishing is generally confined to the private sector. Although legally free, however, Uruguay's press faces some real limitations. Still, no government censorship exists, and anyone can produce a newspaper by registering before an official at the Ministry of Education and Culture. The International Journalists' Network uses three characteristics to evaluate a press system: 1) state advertising as a means of bargaining; 2) budget and personnel cuts; 3) information of low quality. The politicians and military officers who took control in the 1970s used advertising as a way to leverage for positive media coverage. In 2002, a vicious cycle existed between the state and the press to such an extent that Uruguayan press systems basically depended on the state in order to cope with the high cost of publishing and the overall economic downturn throughout the country. Newspaper budgets are achieved, more or less, from the 35 percent coming in from sales and the 65 percent from advertising from both public and private sources. 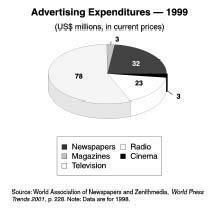 The 1997 economic crisis, however, resulted in a 39 percent decline in advertising. The situation worsened after 1997 when the government reduced its advertising budget by 50 percent, contributing to budget cuts and layoffs in the communications sector. One result of the regional economic downturn, according to the Association of the Uruguayan Press (APU), was that the communications sector lost about 300 jobs, and many professionals received salary cuts that in some cases reached 50 percent. Other economic threats are connected to a proposed bill that would levy value-added tax (VAT) on the sale of newspapers and magazines. The bill proposes to broaden the VAT's scope and lower the existing rate of 23 percent, one of the world's highest. The resulting effect would be an increase in retail prices, the closure of small publications, and ultimately the restriction of freedom of expression in the country. As of 2002, Uruguay had not developed any legislation regulating radio and television. Most radio stations obtain their "precarious and easily revocable operating licenses by executive decree" (Faraone and Fox 148). Defamation, contempt, and libel continue to be considered criminal offenses, a holdover from the past. Article 173 of the criminal code lists two definitions of desacato (insult), which is considered to be the undermining of official authority. The concept of insult includes "offensive words and gestures," which might be punishable by 3 to 18 months in prison. The 1989 Press Law 16.099 also provides for prison sentences of three months to two years for "knowingly divulging false news that caused a grave disturbance to the public peace or a grave prejudice to economic interests of the State" or for "insulting the nation, the State, or their powers." The authorities did not use this law during 2001. Journalists generally do not feel motivated to engage in investigative journalism in part because of low salaries and low morale. In some of the few instances where reporters do investigative work, they may censor themselves to avoid possible repercussions. The country's highly secretive banking and tax laws severely hinder coverage of corruption. Many Uruguayans only learn about state-sponsored corruption allegations by watching Argentine cable channels. The Uruguayan Press Association denounced local TV channel 12 in September 2001 for censoring parts of an Argentine show in which an Argentine politician exposed alleged money-laundering involving Uruguayan companies. As of 2002, a right-to-information bill remained stalled in the Uruguayan Congress. Introduced in 1998, the law would guarantee the right of access to public records kept in government archives and would give preferential treatment to media requests for such information. In the early 2000s, Uruguay was receiving more attention from global media giants. The most aggressive participant in Latin American television growth, Murdoch, started a Spanish version of the U.S. network Fox TV. The U.S.-based CBS network bought Tele Noticias in 1996, with service available for cable systems reaching over 20 million homes throughout the United States and Latin America. The primary reason for purchase was expansion into the Latin American market. The U.S. network NBC launched a Spanish language news service in March 1993, Canal de Noticias. It emphasized information from the Americas and was prepared by NBC in New York. CNN began its regular Spanish-language service in January 1997. Reuters has been in the region for decades and continues to be an important player in South American newsgathering. Radio broadcasters have long been divided over the issue of community radio stations. In 2002, more than 20 of them operated without a permit in Uruguay. While commercial stations claim that community stations inter-fer with their frequencies, community stations argue that they could not afford to buy frequencies, which are at the time granted through auctions. In October 2001, representatives from both sides met with officials from the country's telecommunications regulatory agency, for preliminary negotiations on creating a legal framework for the operation of community station. Radio and television receive their economic profits exclusively from public and private advertising. It is more difficult to start a radio station than a newspaper. In principle, the National Direction of Communications in Uruguay, an agency to which all electronic media are subject, depend on the Ministry of National Defense for permission to operate. The president grants final permission. The Uruguayan government established the office of radio diffusion (SODRE) as a public communications service. The electronic media dedicate considerable time to music, foreign soap operas, and other entertainment. In the early 1990s cable television evolved in Montevideo. This communications medium has gained popularity in the rural areas before spreading to the capital. The three main companies that provided cable in Montevideo are Bahía Esmeralda , Tractoral, S.A. , and Riselco, S.A. The newspaper La República accused the cable companies of trying to impede the spread of satellite services such as DirecTV. 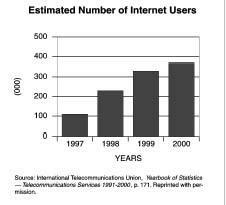 As of 2002 access to the Internet was available to anyone with a telephone line and enough money for a computer. There is no censorship of Internet sites by the government or other organizations. Several of the primary newspapers, magazines, and even radio stations have Internet sites. Online magazines address a variety of issues, for example, Charoná (the youth culture), Mujeres Prohibidasa (sexual orientation issues), and Tercer Mundo Económico (economics). In the early 2000s, a college degree was not necessary for journalists. The universities that offer a degree in Communications are Universidad Católica, Universidad ORT, and Universidad de la República Oriental de Uruguay, all located in Montevideo. In the early twenty-first century, while it was unclear if Uruguay would ever regain its moniker "Switzerland of Latin America," the healthy media industry there continues to play a role in presenting various viewpoints and voices to a generally literate, urban population. However, Article 173 of the criminal code and the 1989 Law 1.099 that discuss penalties for desacato (insult) to the State constitute a legal threat to freedom of the press and to journalists and broadcasters who address political and social issues. Self-censorship is still practiced by many broadcasters. Print media is experiencing a downturn as advertisers invest less, while the Internet, radio, and television continue to grow and to attract larger audiences. The primary factor in determining the future of Uruguay's press system continues to be the country's and region's economic condition. Cole, Richard R., ed. Communication in Latin America: Journalism, Mass Media, and Society. Wilmington, DE: Scholarly Resources, Inc., 1996. Committee to Protect Journalists. Attacks on the Press 2001—Uruguay, 2002. http://www.cpj.org . Faraone, Roque, and Elizabeth Fox. "Communication and Politics in Uruguay," Media and Politics in Latin America, ed. Elizabeth Fox. London: Sage Publications, 1988. Goodwin, Paul. Global Studies: Latin America. 10th ed. Storrs, CT: University of Connecticut Press, 2003.
International Journalists' Network (IJNet). 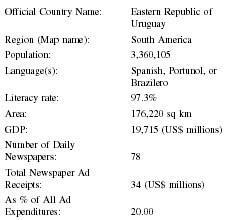 Uruguay: Press Overview, 2001. http://www.ijnet.org . IPI World Press Freedom Review, 2001. www.freemedia.at/wpfr/uruguay.htm . Johnston, Carla Brooks. Global News Access. Westport, CT: Praeger, 1998. Waisbord, Silvio. Status of Media in Argentina, Uruguay, and Paraguay, n.d. http://www.scils.rutgers.edu/üwaisbord/ENCYCLOP.html . I am interested in researching the life of my Grandfather - George Albert Mayer who died on 6/2/53. I understand he founded the English speaking newspaper - The Sun in Monte Video in association with La Manana and its proprietor - Hector Gomez. We also have a name WH Denniston - but I am not sure for what reason. From what we understand he gave all his money to the needy and died a virtual pauper. From reading your above article, I see that La Manana was closed down in the early 2000's due to difficult economic times. I hope to be able to travel to Monte Video next year to fulfill a life long dream of finding out more about him, as from what little I know, he is possibly a man I should be proud to call my Grandfather, even though he abandoned his family in England, including my Father to travel to South America around 1919. George Roper, from the Monte Video British cemetery has found his grave, coincidentally lying next to his own grandparents. GAM has no headstone and apparently his grave was never paid for. I do so hope you can help me further - I have been amazed and so grateful for the support I have already received from Mont Video.